The following is a guest post by Sci-Fi Bloggers. Sci-Fi Bloggers is an online magazine covering all things science fiction and fantasy: movies, TV, books, video games, comics and more. 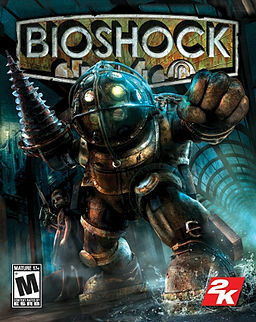 Bioshock was released in 2007, making it a bit dated now. However, it is still well known for having one of the best storyline twists in gaming history (no spoilers here). The Bioshock franchise is still operating, with Bioshock Infinite currently scheduled for release on February 26th, 2013. However, the reason the franchise has been so successful is of course due to the original game. Bioshock tells a chilling story as the protagonist (you) is in a plane crash and ends up entering the underwater city of Rapture. The story immediately drags you into the setting as you go underwater. Everything feels like something out of the 1920s-1940s and that image works really well with the game, just as the choice of radio music did for Fallout 3. You receive help from a man who talks to you over the radio, whom you only know as Atlas. He helps you survive conflicts with splicers, people who have rewritten some of their genetic code and essentially gone crazy in this destroyed city. One of Bioshock's defining and most remarkable aspects is the concept of the big daddy and little sister. Little sisters are little girls who have the ability to harvest adam, which is used to rewrite genetic code and make yourself much more powerful. By taking the adam from these little sisters, you're able to upgrade yourself with abilities like shooting bees from your hands or taking less damage from enemy attacks. Bioshock however, presents you with a choice, do you destroy the girl and get a lot of adam, or rescue her, turning her back into a normal little girl and harvesting less adam in the process? The choice is yours. Whatever you decide though, in order to get to a little sister you have to go through the big daddy. Big daddies are massive beasts in old school diving suits. These behemoths can absorb a lot of damage before they go down and have absolutely no problems dishing it out, making them the toughest enemies in the game. Once you beat the big daddy though, the little sister is yours. Bioshock is a game that really proved that the single player experience still isn't dead in gaming. As much as multiplayer games have taken over the gaming industry (for good reason) there is still a lot to be said for those single player games that are just so much fun you play them over and over. I've personally beat Bioshock five times, let me tell you, Bioshock 2 doesn't hold a candle to it. Bioshock's game play is very unique (or was) and it's story and characters were fantastic. In many games, you find things like audio tracks and other such things. Bioshock is probably the only game I've ever played where I actually listened to the audio tracks. The voice acting was well done and the dialogue was interesting. Some of those audio tracks are just so disturbing and wonderful and help you delve just that much deeper into the game. For example, the audio tracks "The Iceman Cometh" and "The Wild Bunny". Necronomicon, St. Pete, FL—Where I'll Be! Um, yeah. Not far from the truth!